An obscure book of the Bible sandwiched between the pages of the Old Testament which shouts insights for us of the twenty-first century is the Book of Habakkuk. The prophet Habakkuk, a contemporary of Jeremiah, asks a question that I am sure most Christians have asked at one time or another. Written around 612 B.C., the prophet, whose names means to “embrace,” looked around at the corrupt moral, social and spiritual conditions of the southern kingdom of Judah and asked, “How long holy and righteous God will you let evil run rampant and not judge it? How long O Lord will you be silent in the face of rampant, unrestrained wickedness?” (1:1-4). After all, the prophet reasoned, if God is holy, how can He let sin continue unchecked like a polluted river that has spilled over its banks and is contaminating everything it washes over? Waiting patiently for a clarification from God, Habakkuk is left alone with his thoughts (2:1-3). His being baffled is understandable, for the Babylonians slaughtered people without any remorse, plundered every city they invaded and left nothing but heartache and wreckage behind them. And God was going to use these evil people to bring judgment upon Judah! You got to be kidding? Surely, the prophet misunderstood. The prophet stands in awe at God’s power, holy-love, majesty and His just dealings in the affairs of man. Instead of arguing with God, Habakkuk embraces Him in worship and begins to warn His fellow citizens of the coming judgment by a people more sinful and unrighteous than the inhabitants of Judah (Ch. 3). The majority laughed and mocked Habakkuk saying, “We are God’s people. He will not let those more sinful than us bring harm our way.” Very few believed the message of Habakkuk and continued on in their sin and their deliberate departure from God. Too bad they didn’t listen and repent, for the time came when the words of Habakkuk and the active work of God came to pass. In time the Babylonians invaded the Southern Kingdom (605, 598, and 587), slaughtering people, looting, destroying and taking many citizens captive back to Babylon. Judah was left in flaming ruins. As well, in 538 B.C. the Persians conquered the Babylonian Empire and they passed from the scene as a world power just as the Lord stated would happen (Daniel Ch. 5). Events unfolded exactly as God said they would. 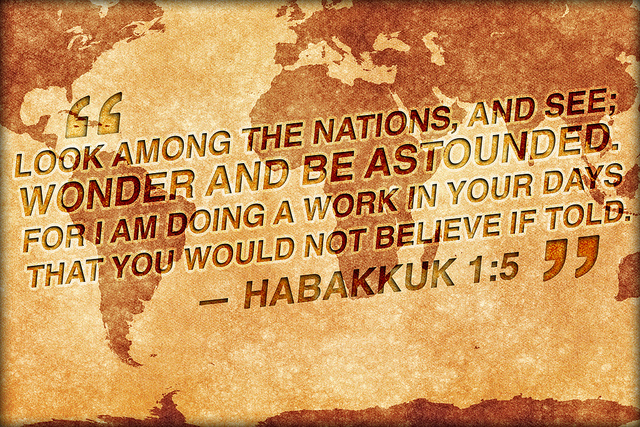 What relevance does the Book of Habakkuk have for us today? We find ourselves as a nation like Judah. We have forsaken the God of the Bible by continually stripping Him from the societal arena. We have defiantly abandoned principles of biblical morality and replaced them with “anything goes.” Those who embrace traditional marriage are mocked. Human dignity and worth is depreciated by abortion, debauchery goes unchecked, greed is rampant, injustice is widespread, perversion is celebrated, good is called evil and evil is called good, and ungodliness abounds. How can a holy God, who opposes unrighteousness, seem to be silent in the face of such a cesspool of sin and defiance? Would He not be going against His own holy nature if correcting judgment doesn’t visit this nation? Let me offer some food for thought, we see being raised up in our very midst a group of people of the likes this world has never seen – ISIS –Islamic State of Iraq and Syria. They are demonic in their evil, ruthless, brutal, beheading individuals, slaughtering Christians by the thousands and all others who disagree with them. The world has never seen such evil like this that has not only vast financial backing but a fearless passion to conquer the world. They have stated they will not rest until they see the ISIS flag flying in Washington, D.C.
USA leaders must see ISIS as more than a regional problem and not be naive to dismiss that they will ever be a threat to the USA. However, they don’t appear to take the threats of ISIS seriously. Just last week a US State Department spokesperson stated that the beheading of US citizen James Foley wasn’t about the US and ISIS isn’t Islamic. The State Department spokesperson stated that “this is not about the United States and what we do. This is about countries in the region coming together to fight a shared threat, and this is not about us. [ISIS] does not operate in the name of any religion. The president has been very clear about that, and the more we can underscore that, the better.” It’s the blindness of Judah all over again. Surely the Lord will not let a people as wicked, evil and demonic as ISIS bring harm to the USA for we are more righteous than they? That was the thinking of Judah. Judah was wrong. I wonder, have a people more unrighteous than the USA been raised up to bring correcting judgment to a nation that has forsaken the spiritual foundation of our Founding Fathers? Like those in the days of Habakkuk we can laugh at and mock such a notion, or we can cry out to God in repentance and pray that God will have mercy upon us. ISIS has one goal, which is to conquer the world and destroy the USA. It is time we fell to our knees in repentant prayer that this evil cancer of ISIS, with God’s help, be eradicated – if not we are going to be knocked to our knees in devastation. The message of Habakkuk is clear: those who don’t learn from the past failures of other nations who have forsaken God are destined to experience His correcting hand. If we don’t believe it, just ask Habakkuk and Judah. This blog does give us something to think about.